WINTER PARK, Fla., Oct. 10, 2018 /PRNewswire/ -- Today, Full Sail University unveiled plans to build a state-of-the-art esports arena in support of Armada, the university's collegiate level varsity esports team, as well as other professional industry esports initiatives. The 11,200+ square foot facility will be the largest esports arena to date on any college or university campus in the United States. In early 2017, Full Sail began the design phase for the facility, and construction started in June of 2018 and is scheduled to be completed by early 2019. Known as "The Fortress," the arena will be fully equipped with the most current technology to host collegiate and professional gaming tournaments, live esports streaming events, and will be used to explore activities including drone programming, possibly drone racing, and more. The customizable facility can support 1 vs 1 games, as well as 100 esports athletes playing simultaneously, and will include occupancy for over 500, allowing spectators to cheer for games live onsite, while remaining flexible for a host of uses. Professionally, Full Sail is working on cooperative initiatives with companies including MSI, Magic Gaming of the NBA 2K League, WWE as they evolve their esports efforts, and others. With a proud history of offering award-winning degree programs in gaming, technology, sports marketing, and more recently, sportscasting, Full Sail is uniquely positioned as an endemic brand in the esports space. The initiative to bring the burgeoning field of esports to Full Sail was organically spearheaded by faculty and students to provide an esports culture on Full Sail's campus, and The Fortress and surrounding initiatives bring formality to that effort. Currently, Armada teams compete in a variety of collegiate-level events in popular games including League of Legends, Smite, Overwatch, Rocket League, Smash Brothers, Dragon Ball FighterZ, and more. "We are excited about these additions to our campus as we continue to strive to make Full Sail the premier destination for students who want to pursue careers in entertainment and media, and specifically, gaming and the various aspects of the live event industry. Whether it be the business aspects of video game ad sports management, the information technology behind synchronized gaming within esports, to shoutcasting, live production, game creation, streaming live-casts, and more, there are a multitude of diverse skills and opportunities for our students to explore. In addition, these efforts support our establishment as a leading global destination for students who want to participate in the esports lifestyle as part of their college experience, be it as a top competitive player, a casual player, a social follower and fan of esports, or an individual selected to learn from our industry partners." said Ken Goldstone, Chief Operating Officer, Full Sail University. Full Sail University is dedicating over $6 Million of direct capital investment to The Fortress and supporting spaces and efforts, and many other indirect initiatives and investments that will benefit Full Sail's esports community and partnerships. "Not only will it be the largest collegiate esports arena, but The Fortress will also house incredible technology aimed at delivering the best esports experience, including the latest generation live video equipment by Ross Video, Sony video monitors and cameras, giant high-resolution LED screens by Absen, multi-zone loudspeaker systems by L-Acoustics, media servers by Green Hippo, and high-bandwidth dedicated internet connectivity to guarantee the best game-playing and viewing experience for our audience," said Luis Garcia, Vice President of Emerging Technologies at Full Sail University. Additional information regarding sponsors, events, special guests, and tournaments will be announced closer to the arena's formal ribbon-cutting ceremony scheduled in 2019. Please visit the official Full Sail website for more details, and follow @FullSail to join the #FullSailArmada conversation on Twitter. Full Sail University is a graduate and undergraduate degree-granting institution offering on-campus and online degree programs in areas related to Art & Design, Business, Film & Television, Games, Media & Communications, Music & Recording, Sports, and Technology. With over 65,000+ graduates worldwide, Full Sail alumni have worked on countless award-winning projects with individual recognition including OSCAR®, Emmy®, GRAMMY®, ADDY®, MTV Video Music Award, and Video Game Award honors. Follow us at Facebook.com/FullSailUniversity and Twitter.com/FullSail or visit FullSail.edu. 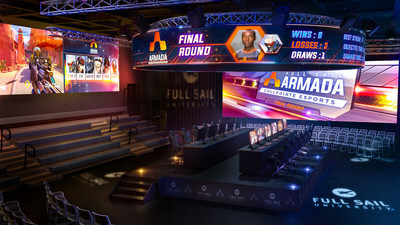 Armada is Full Sail University's official collegiate esports effort in fielding teams that compete in multiple individual and team competitions, both domestically and internationally. The games include League of Legends, Smite, Overwatch, Rocket League, Smash Brothers, Dragon Ball FighterZ, and more. Full Sail's Armada is a proud member of the National Association of Collegiate Esports (NACE), TESPA and CStar League.